One of the biggest, if not the biggest, entertainers the world has ever known has passed away. Michael Jackson died yesterday after going into cardiac arrest in his home in Beverly Hills. The details surrounding his tragic death are still very unclear and it could be weeks until enough information is gathered to make sense of everything. Undoubtedly, the amount of press coverage will be phenomenal. People everywhere are stunned and saddened by the news. Celebrities are remembering him and their condolences are travelling across the internet in a steady stream of tributes. Everyone from Dionne Warwick and Tina Turner to Arnold Schwarzenegger and P Diddy have spoken about their sadness and what Michael Jackson meant to them. My hope is that the media and the press are kind to Michael in his death. He was, without a doubt, a very troubled man who had a lot of personal problems. But from what I have read, the people who were closest to him, while acknowledging his eccentricities, have all pointed out that they never saw him engage in any inappropriate behaviour nor was he ever found guilty of any accusations or allegations. I would like to share with you some of my memories of Michael Jackson as I was growing up. I remember seeing footage of Michael from the early 1970s performing with his brothers as the Jackson 5. His style and ability were years beyond his age. The only other person that I had ever seen dance like him was James Brown and Michael was one quarter of his age when he was doing it. I remember hearing ‘Don’t Stop ‘Til You Get Enough’ and ‘Rock With You’ on the radio all of the time after the release of ‘Off The Wall’ in 1979. It was Michael’s first real taste of super stardom and an indicator of things to come. I remember hearing the first single from ‘Thriller’, ‘The Girl Is Mine’ with Paul McCartney, released about a month before the album. It was very different from the songs I knew on ‘Off The Wall’. Critics and the media hated it. The song made everyone wonder what the album was going to be like and whether it could live up to the success of it’s predecessor. It did. Little did anyone know at the time what was about to be unleashed on the world in the form of the next single; ‘Billie Jean’. I remember seeing Michael perform on a Motown TV special in March of 1983. It changed absolutely everything in the world of music. He sang ‘Billie Jean’ and danced in a way that no one had ever seen before. He performed the ‘moonwalk’ for the first time, appearing to glide, not across the stage but above the stage. My family and I watched in total astonishment. After that, the song ‘Billie Jean’ was on the radio constantly. Every single person I knew bought a copy of ‘Thriller’. My brother and I both had a copy on cassette and we played them continuously for over one year. My father bought it. My aunts and uncles bought it. My friends all bought it. Even people who thought they were too cool for Michael Jackson, had a copy of it somewhere in their collection. 1983 was THE year of Michael Jackson. I remember cycling to my grandparent’s house during the summer of 1983 to watch MTV. I had developed a real passion for New Wave music and couldn’t get enough of all the music videos. Despite a strictly white (and predominantly English) play list during the first two years, MTV did an about face and aired ‘Billie Jean’ and ‘Beat It’ numerous times a day throughout the sping and summer of that year. The songs opened the door for other black artists and MTV broadened it’s musical horizons. I remember seeing the video for ‘Thriller’ for the first time on MTV at the end of 1983. The fourteen minute video had a world premiere like no other before it. The video was played at the top of the hour, every single hour, for the last few weeks of the year. It was like nothing neither I or anyone else had ever seen before. At the time, it was the most expensive video ever made (costing about $500,000.00) and contained nearly ten minutes of the best dancing in the world. And, of course, it had lots of zombies. I remember Michael Jackson being EVERYWHERE in 1984. He was a guest on the song ‘Somebody’s Watching Me’ by Rockwell. 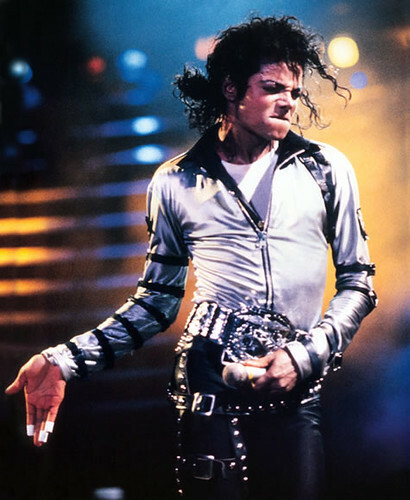 He released the album ‘Victory’ with his brothers and embarked on a tour across the States, playing a lot of the songs from Thriller as well as the classic Jacksons songs. He won eight Grammys for ‘Thriller’. He co-wrote and sang on the single ‘We Are The World’ for famine relief in Africa. He made TV commercials for Pepsi. He sang on Paul McCartney’s song ‘Say Say Say’. He was the biggest star in the entire world. For four or five years as I began to discover the world of music, I listened to everything I could find (or hear) – from my father’s Soul records to Classic Rock stations on the radio to Pop music and New Wave on MTV. Nothing was disregarded. Everything deserved at least one listen. And Michael Jackson was at the forefront of all these genres and my musical tastes. During the time in my life I fell in love with music, he was the undisputed King of Pop. This is how I will remember Michael Jackson.